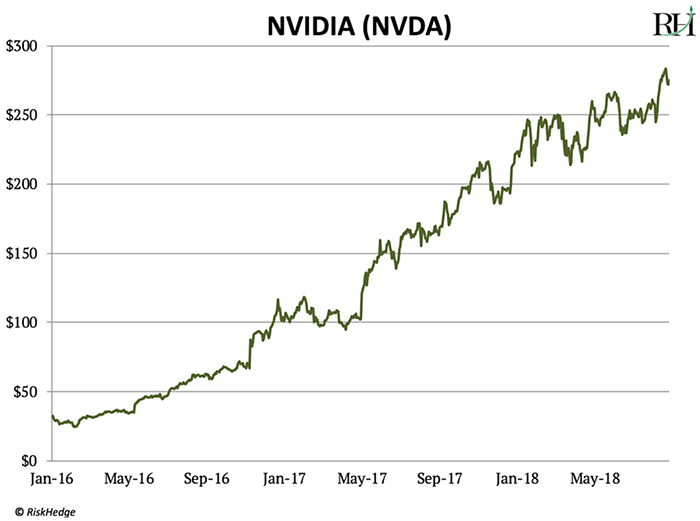 If I could only buy one stock for the next five years… it would be Nvidia (NVDA). Now I know you might be thinking: Stephen, this stock has already had a heck of a run… why buy it now? But when investing in truly disruptive companies, this way of thinking is often a mistake. Amazon has soared another 700% since 2013. Nvidia developed the first mass-market graphic processing unit (GPU) in 1999. GPUs use what’s called “parallel processing,” which allows the chips to perform millions of calculations at the same time. That’s different from the way other computer chips work. Most computer chips, like the one powering the laptop or phone you’re reading this on, calculate one by one. At first, GPUs were mostly used to create realistic graphics in video games. Remember the blocky Nintendo graphics from the early ‘90s? The ability of GPUs to process huge amounts of data all at once helped create the movie-like video game graphics you see today. I’m sure you’ve seen the Hollywood movies about AI going rogue and attacking humans. In reality, AI isn’t that glamorous. It all comes down to processing massive amounts of data. Show a computer millions of pictures of a stop sign, for example, and it will learn to recognize stop signs on its own in the real world. AI is the driving force behind Google’s self-driving car subsidiary Waymo. As I recently discussed in the RiskHedge Report, Waymo’s robot cars are cruising around America’s roads right now. At the core of Waymo’s self-driving car fleet is a centralized “brain.” It has learned to recognize stop signs, pedestrian crossings, red lights, and all the other obstacles that human drivers navigate. The faster a computer can process data, the faster it can “learn” by recognizing patterns in the data. Nvidia latest chips process 125x faster than traditional computer chips. They can process 125 trillion data points per second… which slashes AI “learn” times from eight days to eight hours. This is why more than 2,000 companies including Amazon, Google, and Microsoft use Nvidia’s hardware to “train” their AI programs. Last quarter, the revenue Nvidia earned from selling AI chips and hardware jumped 82%. In the last two years, AI-related sales have accounted for over 70% of the surge in Nvidia’s revenue. AI sales now make up 24% of its total revenue. As I mentioned, Nvidia supplies self-driving car companies with chips that “train” cars’ brains. It also sells hardware that processes data from the cars’ many cameras and sensors. For example, Nvidia’s self-driving supercomputer, named Pegasus, can tackle 320 trillion operations per second. And it does so using one-third the electricity at just one-fifth the cost of its closest competitor. Over 370 companies working on self-driving cars now use Nvidia’s products. Auto sales make up just 5% of NVDA’s total revenue today, and I see this exploding higher over the next few years as true self-driving cars roll out. I mentioned earlier that $100 billion has been spent on developing self-driving cars so far. With the likes of Google and Apple pouring billions into driverless projects, I see that jumping to $1 trillion over the next two to three years. Thanks to its superior technology, I expect Nvidia to capture a large chunk of this. Nvidia is nothing like many of the barely profitable tech darlings (like Netflix) out there. While many high-flying tech stocks get by on stories and hype, Nvidia is extremely profitable. It has a net profit margin of 33%. That is, for every $1 in sales, $0.33 becomes pure profit. That’s better than Google’s 21% margin… and even Microsoft’s 29%. Nvidia’s high margins allow it to continually pour cash into Research & Development (R&D). It reinvests close to 20% of its revenue into R&D every year, which is a key reason why it has blown away its rivals. Nvidia is financially sound, too. It’s sitting on a record $7.95 billion in cash. Which is enough to pay off its total debt four times over. Why I’m Not Concerned About Nvidia’s Price-to-Earnings (P/E) Ratio of 39. Can buying a stock at such a high valuation be risky? Sure. But Nvidia deserves its rich valuation. Nvidia’s earnings are growing at almost six times the rate of the S&P 500. Yet its P/E ratio is not even double the S&P’s. I think investing in a company like Ford (F), with a P/E of 5, is far riskier than buying NVDA. I can hear the groans coming from the value investors out there. But the fact is, Nvidia is leading the self-driving revolution… while Ford is going to get crushed by it. Because it is powering today’s most disruptive trends, I see Nvidia doubling over the next two years. © 2018 Copyright Stephen McBride - All Rights Reserved Disclaimer: The above is a matter of opinion provided for general information purposes only and is not intended as investment advice. Information and analysis above are derived from sources and utilising methods believed to be reliable, but we cannot accept responsibility for any losses you may incur as a result of this analysis. Individuals should consult with their personal financial advisors.